1. Original Mitsubishi engine from Japan with strong power, high efficiency, low failure rate, low oil consumption, low noise. 2. 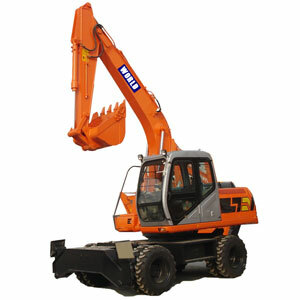 Our wheel excavator (wheel digger) has imported hydraulic pump, valves, motors, pilot valve ensure high performance. 3. Original European axles and transmission as well as our patent of gear shifting without stopping the machine ensure low failure rate. 4. Advanced electrical control system realizes the auto idling function, reducing fuel consumption. 5. Capacious and comfortable cabin with broad field of vision, silicone oil vibration absorbing and adjustable seat. 6. Solid and durable structural components ensure long time and stable operation. 7. Diverse optional attachments meet users' different requirements. 8. Original John Deere engine in accordance with EPA and EC tier 3 emission regulation is at users' option. World Equipment is a professional Chinese manufacturer and supplier of wheel excavator (wheel excavator). In our over 10 years exporting experience, we have accumulated abundant clients and product experience. Our wheel excavator (wheel digger ) has already been exported to Europe, South America, Middle East, Southeast Asia and Africa. We have clients in Congo, Tanzania, Russia, Algeria, Philippines, Kazakhstan, Iran, Saudi Arabia, Nigeria, Indonesia, Malaysia, The United Arab Emirates, South Africa, Australia, Sudan. We offer EL160 (16 Ton) and EL210 (20 Ton) equipped with engines of Mitsubishi 4D34-TL (EL160) and Isuzu 6BG1TRP (EL210). The excellent dynamic property is the powerful guarantee of the product's operation. If you need wheel excavator (wheel digger), please don't hesitate, contact us right now.